Through a curt two-paragraph letter on December 11, 2017, Rajeev Dhavan, senior advocate of the supreme court, informed chief justice of India (CJI) Dipak Misra about his decision to quit legal practice. This was in response to the “humiliating end to the Delhi case” where he was reprimanded by the CJI for speaking in ‘loud tone’. But on December 28, on the insistence of the clients he was representing in the apex court, he decided to change his decision and agreed to continue with his legal practice. 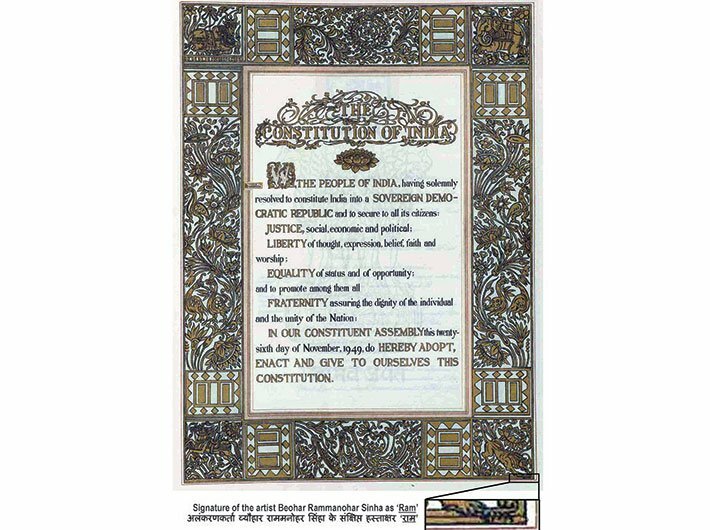 The book he referred to talks about the miracle that the Indian constitution has proved itself to be; by ensuring its survival against several odds, the surrender that it warrants from people because of its ‘contractual nature’ and the hope its exudes in spite of its various failings and fault lines. In the book, Dhavan writes that the reason for calling the constitution a miracle is a belief that “if we were called upon to create a new constitution afresh now, we would certainly fail”. In a freewheeling chat, the legal luminary explains the reason for this assertion and also shares his views on various others issues related to law, constitution and judiciary. Given the state of affairs he talks about, where does this hope, this belief in ‘India being the greatest democracy’ emanate from? He reiterates his views presented in the book. “Pakistan’s constitutional assembly took seven years to produce the constitution of the Islamic republic in 1956. Two years later, it was taken over by dictators. This happened frequently. Pakistani judges had to use what I call ‘juristic witchcraft’ to justify each change. The constitution of Ceylon [now Sri Lanka] of 1948 had to be rewritten and redone. Burma’s constitution of 1948 collapsed; its governance taken over by generals. Bangladesh’s constitution could not avoid turmoil and went the Pakistan way. Even little Nepal struggled to reconcile differences. India’s constitution survived the scare of the Emergency and has continued, its script rewritten with 100 amendments and its meaning transformed by its judiciary,” writes Dhavan. In the book he calls for the abolition of the provision which allows the imposition of the president’s rule on states. According to Dhavan, the use of this provision to dismiss a democratically elected government, while subject to judicial review, should be done away in entirety to protect federalism, which forms one of the most important strands of the basic structure of the constitution. Indeed, among other institutions, the supreme court on many occasions helped people in their fight to live with dignity. The higher judiciary has repeatedly risen to the occasion to safeguard the constitutional edifice and democratic ethos of the country, earning the trust of the people. However, corruption in the higher judiciary has significantly eroded this trust. How do we check this trend? “We have no mechanism to examine corruption in the judiciary. In the lower judiciary, it is done by the high courts. High courts have failed to root out corruption in the lower judiciary. Then, there is hidden corruption in the supreme court. We have the system of impeachment. But that has not been effective. An in-house system was worked out in 1992. Here we saw that transfer [of the judge in question] to the high court of another state was the most frequently used option. Most of the erring judges were transferred to Sikkim. The people of Sikkim must also be thinking why are they getting only such judges,” says Dhavan. Separation of power is indispensable to the smooth functioning of democracy and in this context ‘judicial overreach’ has become a buzzword in recent decades, with the higher judiciary intervening in matters that exclusively lies in the domain of the legislature and the executive. Dhavan feels that the preamble of the constitution is not entirely true in spirit, and he proposes his own “cheeky” version: “We the People of India, who had little say in the making of the constitution but were represented by people selected without mandate, have been informed to accept this constitution, lest there be chaos. The book, while extoling the resilience of Indian constitution, also amply criticises it for its failings in ensuring distributive justice. “How long shall we continue to deny equality in our social and economic life? We must remove this contradiction at the earliest possible moment or else those who suffer from inequality will blow up the structure of political democracy which this assembly has so laboriously built up,” writes Dhavan. 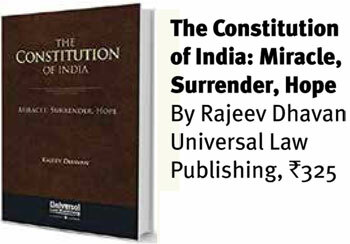 This persistent juxtaposition of successes and failures makes ‘The Indian Constitution: Miracle, Surrender, Hope’ a thought-provoking read. The book by all means is an oxymoronic interpretation of the Indian constitution, where ‘hopeful- despair’ and ‘despairing -hope’ underline the present, past and future of Indian constitution and democracy, leaving the reader with many questions than answers.